where we can see the beauty and ingenuity of the natural world through photos from National Geographic. 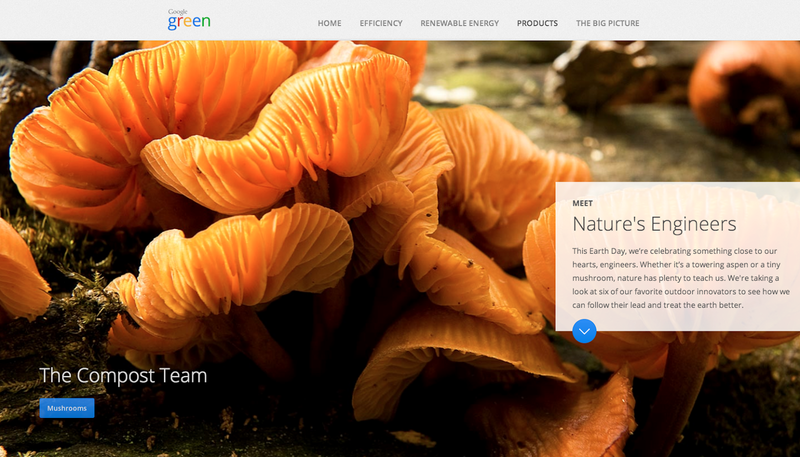 We also want to provide easy ways to be greener in our own lives, so this site shows us how we can all be like those organisms by taking simple actions to care for the environment. , signed agreements to procure wind power near our data centers, and installed solar panels at our corporate headquarters. It’s also important to work directly with our utility partners to find solutions that will make more renewable energy available for us and for others. The most straightforward way to do this is for utilities to offer a renewable power option for companies that request it—something that’s not currently offered by most utilities. We’ve just published a white paper laying out our thoughts on how and why such programs might work. We’re also announcing our first effort to put this idea into practice. We’re expanding our Lenoir, NC data center, and our local electricity provider, Duke Energy, has pledged to develop a new program for large companies like Google who want to buy renewable power for their operations. Duke will file the plan with their state commission within 90 days. 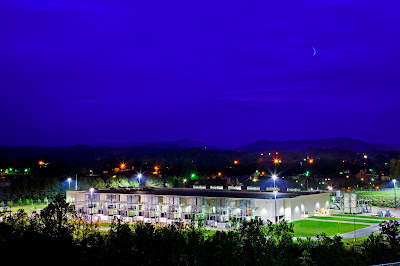 Our data center in Lenoir, NC. 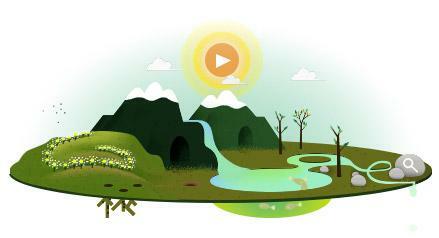 Offering companies like Google a renewable energy option has many advantages. Because the service is made available to a wide range of customers, companies that don’t have the ability or resources to pursue alternative approaches can participate. And by tapping utilities’ strengths in power generation and delivery, it makes it easier for companies to buy renewable energy on a larger scale. Of course, the approach is not without its challenges: utilities will need to work out the mechanics of the service within their local regulatory structure, and in many cases state utility commissions will need to approve the programs. There’s also the challenge of finding cost-effective renewable projects. We'll continue to find creative ways to supply our facilities with renewable energy, but we think this solution can provide an important new way to increase the use of renewable energy nationwide. We look forward to working with utilities, state utility commissions, companies and other stakeholders to make it a reality. We’re always looking for ways to expand the use of renewable energy. To date we’ve committed more than $1 billion to renewable energy project investments, signed agreements to procure wind power near our data centers, and installed solar panels at our corporate headquarters. 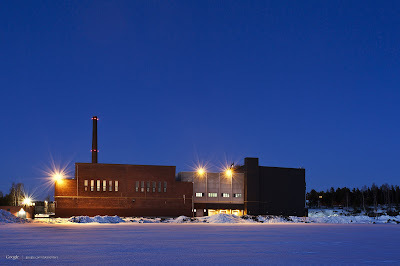 , Finland and Ireland - have now joined our U.S. facilities in receiving ISO 14001 and OHSAS 18001 certification. In order to receive these certifications, you need to say what you’re going to do, then do what you say — and then keep improving. The ISO and OHSAS standards dictate what key elements are required, but it’s up to us to figure out how to follow through. So we’ve developed a comprehensive system of procedures and improvements that our data center teams follow every day. 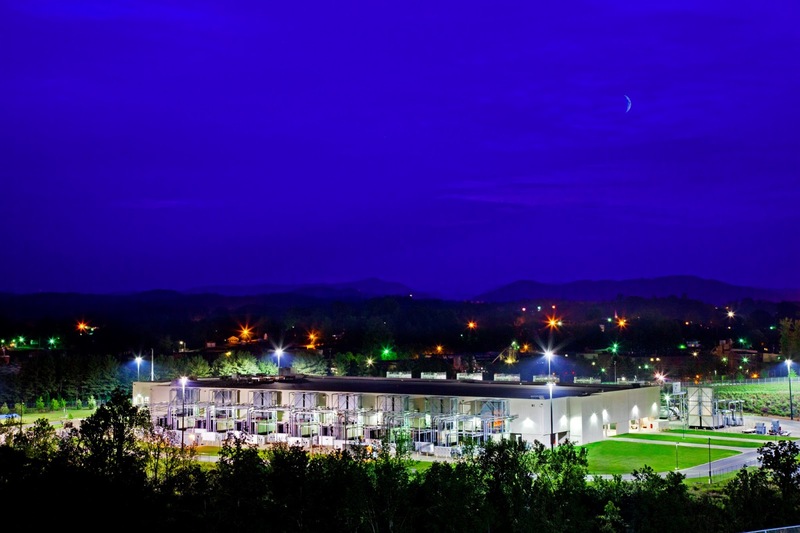 Each of our data centers is different, so many of the improvements we’ve implemented are specific to local needs. In Belgium, we use an evaporative cooling system that’s well-suited to the temperate climate. 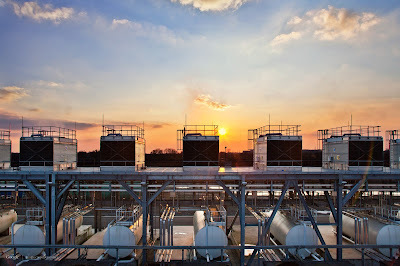 After cooling the servers, water runs through large cooling towers, where much of it is released as water vapor. This process is very energy efficient, but keeping the cooling towers clean and clear of outdoor dust is a time-consuming process. So the team tried a simple fix: they attached screens to the outsides of the towers, which allow air to flow freely but cut down significantly on the amount of build-up. This worked so well that our other data centers have begun to install screens as well. Screens keep outdoor dust from entering these cooling towers. In Ireland, we’ve found a way to use excess heat coming out of the server rooms to heat our office space. Hot air that would normally be sent outside through our cooling infrastructure is instead drawn over an air-to-air heat exchanger, where it is used to heat up incoming fresh air for the office area. This eliminates our need for gas heaters in the facility, and, like in Belgium, it’s working so well that we’re considering implementing it at other facilities. In Finland, where we cool the data center with seawater, we want to bring the temperature down before sending the water back into the Gulf. So we built a “tempering hut,” where we manually mix the outgoing warm water with fresh cold water. We’re constantly tweaking the temperature and amount of the cold water to reach the optimal temperature, and we track that data as part of our ongoing efforts to monitor and improve our operations. The tempering hut, the small building on the far left, is where we cool water down before returning it to the Gulf of Finland. We want to lead the industry in environmental management and workplace safety, and we’re proud to be the first major Internet services company to achieve these certifications across their entire U.S. and European fleet. The Internet is a virtual place for most people, but data centers -- the large industrial warehouses filled with servers that power the web -- are anything but. We want our data centers to be both environmentally sustainable and safe places to work, so we make sure that that they meet the highest standards of environmental management and workforce safety. Our three owned-and-operated data centers in Europe - located in Belgium, Finland and Ireland - have now joined our U.S. facilities in receiving ISO 14001 and OHSAS 18001 certification.